Airplane seats: Why aren't they designed more thoughtfully? Why aren’t airplane seats designed more thoughtfully? For aeronautical engineers, aircraft design concerns aerodynamics, flying capabilities, airframe strength, fuel consumption, and so on; but for the rest of us, design is mainly about the seats. Designing a comfortable seat is about more than getting dimensions and angles right and having padding in the right places; it is also about accommodating motility, that is, allowing the sitter the opportunity to shift and change body positions from time to time. Being totally immobile is inherently uncomfortable, but sitting in one position for hours at a time is precisely what we do on planes, which is what makes aircraft seats such a challenging design problem. On top of that there is the need to accommodate storage, TV screens, and lighting. Airline seats don’t come with the plane; they are manufactured for individual airlines by specialized companies such as Weber in the United States, Contour in Britain, and Recaro in Germany. Since seating in coach now seems to respond to only one requirement, to cram in as many seats as possible—the Sardine Principle—there is not much to say about the design of its seats. (Helpful hints about better and worse seating options on different aircraft and different airlines can be found at SeatGuru.) What about business class? I flew transatlantic in US Airways’ business class recently and noted two positive design innovations in the seats: a coat hook so you could hang up your jacket instead of scrunching it up in the overhead bin and a holder to accommodate a container of bottled water, which everyone consumes in large quantities during flights. Otherwise, the design was pretty much a mess. For some reason, the video screens were detachable, and the harried flight attendant spent a lot of time at the beginning of the flight distributing the iPad-like screens, installing them in the clunky holders, plugging them in, and then reversing the procedure at the end. 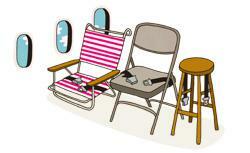 The volume controls were hidden in the side of the seat arm; the tray tables folded awkwardly into the arm-rest. There were two flat seat pockets, but neither was large enough to hold a laptop. The reclining seat had complicated controls but didn’t quite lay out flat. The bulbous, heavy chair seemed to have been modeled on a 1950s-style recliner, or one of those captain’s chairs that you see in large RVs—and promised more comfort than it delivered. Perhaps the airlines should consider hiring different designers to help them with their seating. I don’t mean Giorgio Armani or Ralph Lauren. In the early days of aviation, the great industrial designer Raymond Loewy worked on the Alouette helicopter as well as the interior of Air Force One for John F. Kennedy. Walter Dorwin Teague, who is remembered for the classic Kodak Brownie camera, designed the interior of the Boeing 377 Stratocruiser. And Henry Dreyfuss, who is responsible for the classic Bell 300 telephone, designed the interiors of the Lockheed Super Constellation and later the Boeing 707. In the Super Connie, Dreyfuss broke up the long fuselage into “cabins,” using wood-paneled dividers to give the impression of a living room and having a midplane “lounge” with fabric-covered sofas and easy chairs. First class had tables with lamps. The general idea was to make flying a more familiar experience. For the 707, America’s first production jet airliner, Dreyfuss designed cantilevered seats that greatly increased underseat storage space. There are indications that thoughtful design is returning to the flying world, at least for some passengers. Most business-class seats have power ports, allowing passengers to charge laptops and iPads during long flights, and some have a massaging feature. Several airlines (Cathay Pacific, Air New Zealand, Air Canada) have adopted so-called herringbone seating in business class, an arrangement pioneered by Virgin Atlantic. The layout resembles diagonal parking and is intended to give all passengers unimpeded access to an aisle (a big problem with fully reclining seats is that they effectively box in the passenger in the window seat), as well as more privacy. Moreover, the arrangement allows the seat to fold out perfectly flat, like a bed. British Airways has equipped the business class of some of its long-haul flights with something called reverse-herringbone seating, where the seats are arranged head-to-toe to maximize space (a lugubrious analogy, but the same principle as a coffin, which is wider at the shoulders than the feet). A storage drawer has been thoughtfully provided for laptops and chargers, and the armrests fold out of the way when the seat is extended flat so there is more shoulder room. Since the individual seats are surrounded by waist-high partitions, I felt as if I was traveling in a private compartment, sort of like being in an old-fashioned Wagons-Lits sleeper. Now if they just had a dining car.